The name of last night’s “KO Night Boxing: Step Up” event certainly was appropriate as 2016 Olympic bronze medalist Nico Hernandez had to overcome a major obstacle to remain undefeated at Hartman Arena in Palm City, Kansas. “KO Night Boxing: Step Up!” was a presentation of KO Night Boxing LLC., in association with Roc Nation Sports and Hartman Arena, sponsored by Mort’s Cigar Bar, Jimmy Egg and Twister City Harley-Davidson. The action was taped live for future airing on CBS Sports Network. St. Louis southpaw Kendrick “Uprising” Latchman outweighed regular flyweight Hernandez by more than 10 pounds when the two fighters entered the ring because Hernandez’ scheduled opponent, Basyzbek Baratov (2-1-2), abruptly pulled out of the fight after the weigh in due to a contractual disagreement. Hernandez weighed in at 113 pounds, Baratov was 112, which was the contracted weight. The Kansas Athletic Commission, however, automatically allows one-pound over for all non-title fights. Baratov refused to fight but Latchman agreed to fight at a 125-pound catchweight. Hernandez gained four pounds and the fight was on. Wichita hero Hernandez was unmoved by the late change, largely due to his standout amateur career, in which his opponents often changed at the last moment. Latchman (1-5-1, 1 KO) is a pro boxer-MMA hybrid fighter who is 6-3 (5 KOs) in MMA, including a 55-second stoppage of 14-7-1 Cody Land this past July. Latchman buzzed Hernandez in the first round, much to the chagrin of the Hernandez’ loud hometown crowd. The U.S. Olympian displayed a good chin and went on to win a six-round unanimous decision to improve his pro record to 3-0 (2 KOs). KO Night Boxing LLC announced that Hernandez would return December 2 to headline another show at Hartman Arena. USBA No. 2- rated featherweight Tramaine “The Might Midget” Williams (13-0, 5 KOs), fighting out of New Haven (CT), cruised to his 13th victory without a defeat, taking a one-sided 10-round unanimous decision over Derrick Murray (13-3, 5 KOs), in the co-featured event. 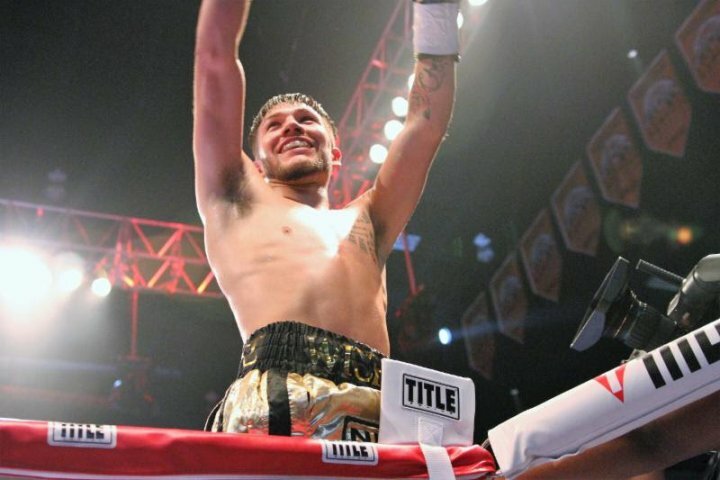 Key West, FL welterweight Armando “The Gentleman: Alvarez (17-0, 11 KOs) remained undefeated, winning a 10-round unanimous decision against Hungarian champion Gabor “Squirrel” Gorbics (23-8, 14 KOs) in a competitive Special Welterweight Attraction. Alvarez is the WBC Latino welterweight title holder. Undefeated Chinese heavyweight prospect Zhilei “Big Bang” Zhang (18-0, 14 KOs), the reigning WBO Oriental champion, needed only 2:28 to stop veteran Byron “The Bear” Polley (30-22-1, 13 KOs). Zhang, as well as Williams, are promoted by Roc Nation Sports. In the most dramatic fight of the night, Los Angeles heavyweight Scott Alexander (13-2-2, 7 KOs) rebounded from being decked, as well as a pre-fight cut, to knockout 361-pound Richard “Silverback” Carmack (15-12-1, 12 KOs) in the second round. Alexander suffered a cut on his shin that resulted from a step breaking as he entered the ring. Milwaukee junior middleweight Akeem Black (3-1, 1 KO) won three of four rounds on all three judges’ scorecards for a four-round unanimous decision over Marcus Neal (2-2, 2 KOs). Wichita light heavyweight Jeff Strum pitched a shutout in his pro debut against Topeka’s (KS) previously unbeaten Chris Ortega (3-1-1), winning all four rounds in impressive fashion. Chris Ortega (3-1-1), Topeka, KS. Marcus Neal (2-2, 2 KOs), Kansas City, MO.